FrontPoint Security is one of the highest rated security system in the United States, and despite its size it has only received 65 complaints from the Better Business Bureau in the last three years. Their systems come in three options, all of which are based on wireless monitoring: the protection plan, the interactive plan, and the ultimate plan. Even the basic protection plan includes wireless and cellular monitoring, intrusion, fire, and environmental protection. As the plans advance so does the price. The interactive plan gives you remote access through your phone or wireless devices, email and text alerts and other options that make it worth the cost. The last plan includes video monitoring on a live stream that you can view on your laptop, among other more advanced options. Most other security systems cannot compete with the ease of service FrontPoint provides. After placing your order the system is sent directly to you for self-installation. Unlike other security monitoring companies, FrontPoint gives its customers a 30-day risk free trial period. One of the easiest security systems to install and use, customers love FrontPoint’s simplicity. The convenience and accessibility of customer service as well as their ability to resolve problems quickly have led to a consistently high rating and few, if any, complaints. Not just user-friendly, FrontPoint is also more consumer focused than other companies. Unlike many of its competitors, the risk-free 30 day trial allows customers to test the system before truly committing. While some companies seem to have hidden charges, long contracts and high early termination fees, FrontPoint isn’t one of them. The minimum contract starts at one year, which allows for more flexibility when compared to the three-year minimum contracts many other companies require. FrontPoint is also an excellent option for renters and people who may move in the near future. Many companies charge extra or extend contracts when people move, but FrontPoint sends a moving kit with packing boxes and new adhesives for the sensors free of charge. Users don’t just feel safe with this system, they also feel valued and able to trust this company. When complaints do arise, the company is quick to address and remedy them, making even people who have had troubles likely to recommend them. Some setbacks might include a slightly lower response time when compared to other leading companies. Although the differences is only by a few seconds, when it comes to home security the fastest response time might be the most important factor to some customers. Another difference between FrontPoint and competitors are their warranties. While many companies offer lifetime warranties on the equipment, FrontPoint’s is only three years. This, combined with high upfront costs may be one of FrontPoint’s biggest deterrents. FrontPoint has a stellar reputation of addressing customer support issues quickly and efficiently and also of making the installation, use and moving of their systems convenient. Although FrontPoint has only been in the security monitoring business since 2007, they have taken the market by storm. 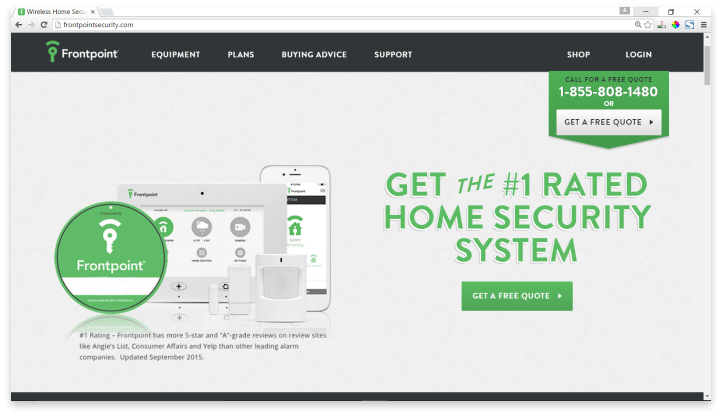 They are one of the most customer-friendly home security monitoring companies. Not only do they address complaints quickly and efficiently, they also make installing, using, and moving with their systems convenient. Sometimes people feel taken advantage of by security monitoring companies but that definitely isn’t the case with FrontPoint. If you can afford the up-front costs and monthly payments, this is a very reliable and trusted option. Have you had an experience with this company? Please share your Frontpoint reviews below.